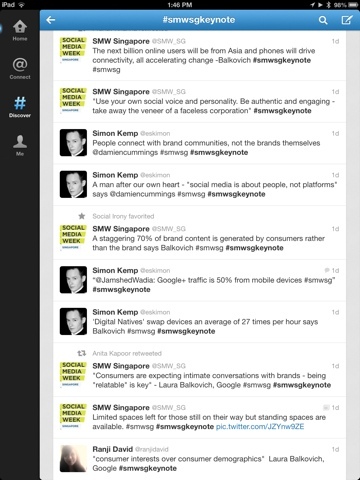 Social Media Week Singapore began with great fanfare and truly amazing discussions yesterday. 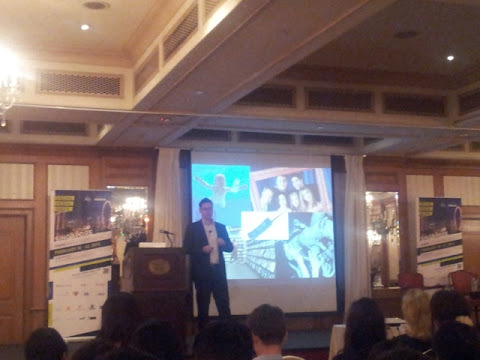 I was all excited to hear @damiencummings of Samsung Digital, Asia present his keynote along with Laura Berkovich of Google! Certainly similar to their combination in the business space, both speakers from Samsung and Google held the audience by presenting very key specs of information and most importantly to highlight what's the crux of the social media space in today's world. Thought I've researched a bit before coming to the event, about the market in Singapore, I may not be the best person to comment on how their presentation related to the scenario out here. However was interested in knowing attributes that they presented from an overall global perspective. And from my past experience with working on various brands and in the social web space since 2009 I'd certainly relate to a lot of issues that they highlighted and how the Social Era of business is changing everything we see, especially with the expansion of Social/Digital/Mobile! 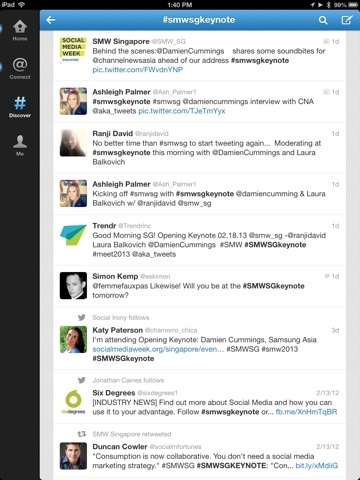 Also how brands are shifting their trajectory by being more personal to users is what I've always enjoyed to see. Glad to see so much of advocacy of that phenomenon showcased by both Laura and Damien. I also asked a question to Laura about how Social Search is going to affect / impact brands especially with Google+ and FGS coming into effect. To which her response was 'How people googled earlier and there wasn't any Social elements coming forth.' Today if people search for content, they expect everything to be out there for their perusal. How peer recommendation will impact most brands as well in this aspect. 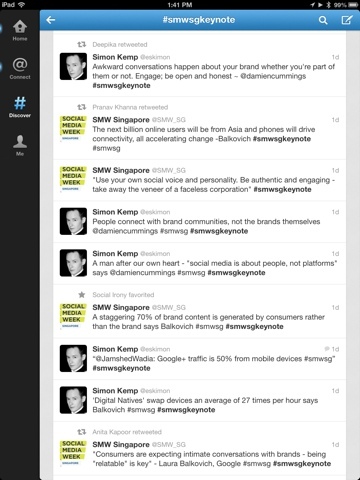 I must commend AKA Asia and #SMWSG for thoroughly prepared and well co-ordinated start to the event, and especially for giving us the Nokia powered, Social Media Week App. 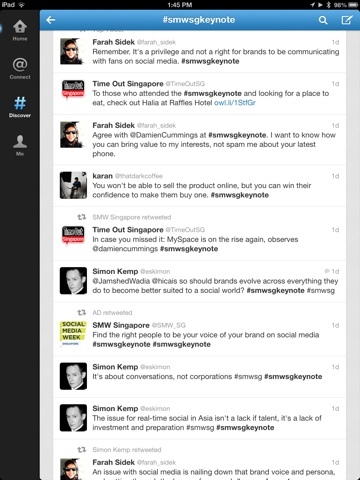 Some of the tweets for this event, in case you want more insights.